Today’s recipe is an incredibly versatile one: low carb wrap. You can make the wrap and add any filling you like, just use your creativity! For this video, I used chicken breasts, yoghurt, spinach, and guacamole. You can also make sweet versions, adding fruit, chocolate or any nut butter. YUM! Add all ingredients in a small bowl and using a fork whisk all ingredients until well combined. Heat a large non-stick frypan and pour the mixture in. Cook it for like 2 minutes or less, then flip to the other side and cook for another 1 minute or so. It’s done! You can add any fillings you like, use your creativity! Looking for more ideas for breakfast? You can find amazing recipes on our Low Carb Breakfast series page! 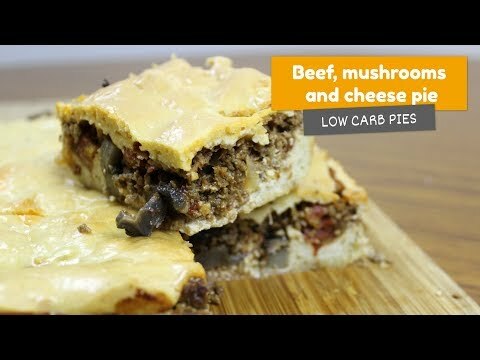 Here it is one more episode part of our Low Carb Breakfast series! And for today, I bring to you a very simple and classic breakfast option: Scrambled eggs. Put a frypan on low heat, then add butter (or coconut oil) and let it melt. Next, add the slightly beaten eggs and season them with black pepper and salt to taste. Now, pay attention, these eggs MUST cook slowly, we don’t want overcooked and rubbery eggs. To ensure that, keep an eye on them while stirring gently. Do it until you feel the eggs are cooked enough (remember, we don’t want overcooked eggs). Once the eggs are cooked through, it’s done! Place them immediately on a plate and serve. For today I thought about bringing this perfect Paleo and Gluten-free Breakfast Granola. It is super healthy and packed with good stuff: nuts, coconut flakes, seeds, flaxseed, and it uses honey as the sweetener, but you can totally ignore it from the ingredients list in case you need something even lower in carbs. This works divinely as a topping on yoghurts or as a breakfast cereal with any milk of your choice (learn how to make cashew nut and coconut milk). The other positive thing is that you can change the ingredients according to your taste and, of course, with what you have available at home. Just keep the same proportions and everything will work fine. Ah! Before I forget, you can leave it out of the fridge for a few days but it will last longer if you refrigerate it, something like two weeks. In a large bowl add all the nuts, sunflower seeds, sesame seeds, flaxseed meal, coconut flakes, and salt. Mix them well and reserve. In saucepan add: honey, coconut oil, ground cinnamon, and ground nutmeg. Stir gently on low heat until everything melts. Then, turn off the heat and add vanilla extract. Pour this liquid over the nuts and seeds. Stir very well to coat all ingredients. Grease a large baking tray with some coconut oil and line it with baking paper. Spoon the mix into the tray and flatten using a spatula. Preheat oven to 165°C (330°F). We will bake in three stages. First, bake for about 12 minutes and then stir the mix. Then bake for 8-10 minutes and stir again. Finally, add the dried fruits, stir everything and bake for the last 4-5 minutes. Remove and let it cool completely. It should have turned crispy and dark golden brown. It’s done! You can leave it out of the fridge for a few days but it will last longer if you refrigerate it (up to two weeks). This is part four of our Low Carb Breakfast series! Have you seen the other videos already? Sometimes I make it for lunch as well, especially when I’m going out for a hike, long walk or even to the beach! Place 1 nori sheet on a sushi mat (or non-stick baking paper) and layer half of the avocado slices on it. Make sure lo leave a small space close to the edges. Then, add two strips of cucumber, followed by half of the chicken breasts (100g). Now it’s time to roll it up! Gently lift the end of the mat closest to you and roll it over the ingredients to start the process. Continue rolling the mat forward to make a complete roll. With one hand on top, gently roll the mat back and forth a few times to get a nice and firm rounded shape. This recipe gives you two rolls, so follow the same steps to make the second one. Time for the third episode of our Low Carb Breakfast series! Are you enjoying it? On today’s video, you will learn how to make this very simple and delicious 3 ingredients pancake. I love to make these pancakes on Sunday mornings for a lazy breakfast! They are so easy and nutritious. Yum! You can use this exact same recipe for other pancakes flavours, for example, sometimes I use 3 tablespoons of mashed sweet potato as a replacement for the banana or a simply add more nut butter. Check the directions below for the complete instructions. Add all ingredients in a blender. Keep in mind that the banana must be over-ripe to bring enough sweetness to our pancakes. Blend until everything is well combined. Warm a non-stick fry pan and grease it a little bit with coconut oil. Pour around ¼ of a cup of this mixture, letting it cook for like a minute, then flip to the other side. Keep doing that until your batter is gone. This recipe will give you 6 small pancakes. It’s done! Serve it warm, with some butter and extra bananas.